subsequent oxidation processes has provided excellent specimens of copper, lead, zinc, iron and tungsten minerals with world class specimens of caledonite, campylite (var.of mimetite), hemimorphite, linarite, and plumbogummite. In total 160 or so different species have been identified from the Caldbeck Fells. An important attraction to collectors was that many of the species were rare oxidised ores only occurring in small crystals, potentially therefore good specimens could be found on the old mine dumps and outcrops. 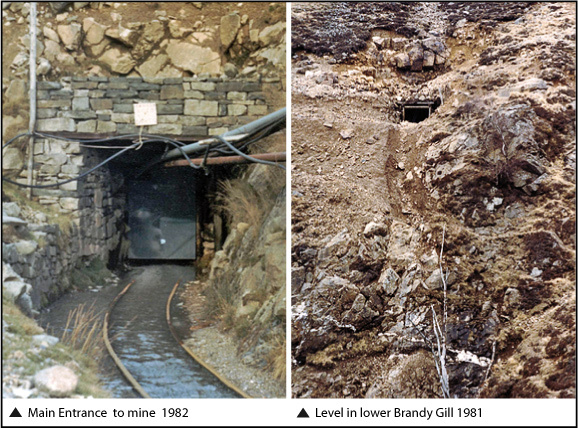 Carrock mine's relatively recent re-working also contributed to drawing mineralogists to the area. Apart from the veins worked at Carrock, crystallised primary ores such as galena, sphalerite and chalcopyrite are rare. During the latter part of the 20th century the work of amateur mineralogists has resulted in a crop of new species discoveries for the area including bechererite; chenite; claudetite; elyite; fulloppite; langite; mixite; mattheddleite; ramsbeckite; scotlandite and others. In the late 1990s conflicting pressures on the area has led to a licensing system for collecting, the mechanism for which effectively means that for most amateurs collecting is no longer possible. The latest arrangement for collecting (2006) is that the Caldbeck Fells are now 'Traffic light' zoned with areas classified for collecting as red, amber or green. The details of these can be found on the Lake District National Park Authority's website. Historically, the mineral deposits in the area are thought to have been worked at least as far back as the 12th century, although documented evidence only goes back to the mid-fifteenth century when skilled German miners arrived in the area during the reign of Queen Elizabeth I, leading to the formation of the Company of Mines Royal. 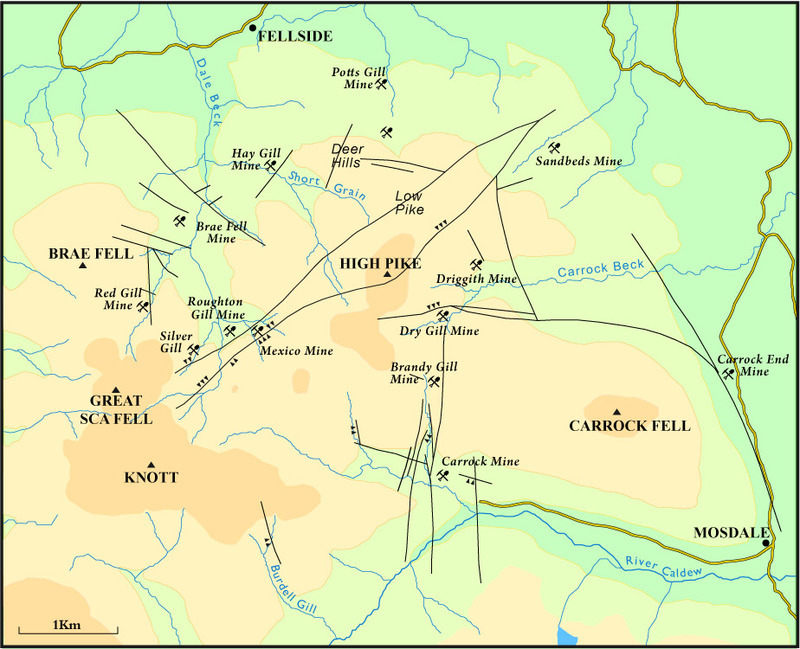 They worked a number of mines in the Keswick area including Roughton Gill which was regarded as one of the richest. Mining continued sporadically into the 17th century although by the outbreak of the Civil war in 1642 the Keswick smelter was no longer working. The discovery of the rich Driggith deposit put new life into the area in the early part of the 17th century but it is probably from the 1820's that the most substantial exploration of the deposits took place with many mines in the area being worked, the smaller ones though usually on an intermittent basis. External economic factors and exhaustion of the ore bodies brought an end to copper and lead mining by the turn of the century. A feature of the area was that although many veins were rich at surface they pinched out at depth. The only significant workings in the 20th century were the Potts Gill/Sandbeds mine for barytes and Carrock mine for wolfram with Driggith mine being worked on a small scale in the 1940s. All are now closed. The more common occurrences of minerals found at the various mines and exposures are shown below but the list is by no means exhaustive. 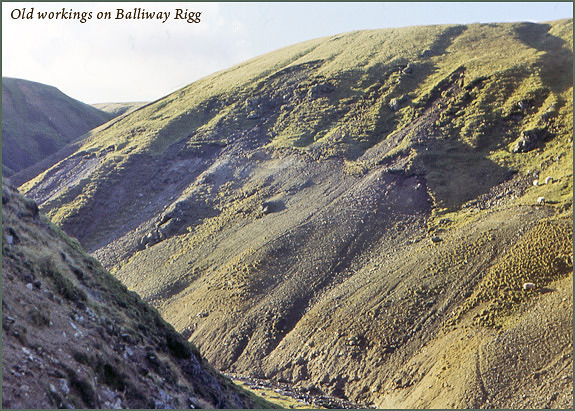 For a more comprehensive list I would recommend M.P.Cooper and C.J.Stanley's book - Minerals of the English Lake District-Caldbeck Fells, and the UK Journal of Mines & Minerals, issue number 22- Minerals of the North of England. Large fairly unproductive tips but occasional hand-size pyromorphite specimens have been found and smaller examples of anglesite, hydrocerussite, lanarkite, leadhillite and mattheddleite. 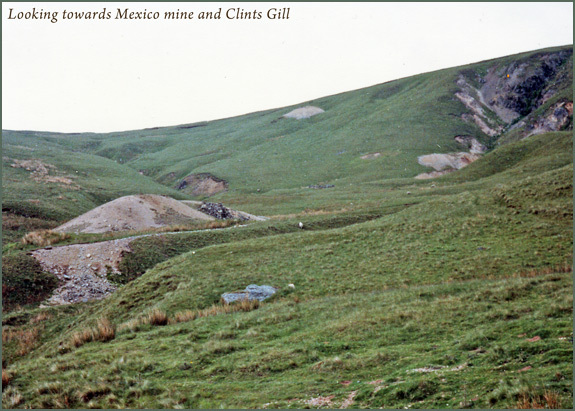 An old lead mine in the upper reaches of the gill produced bayldonite, cerussite, duftite, linarite, mimetite, stolzite, and other rare supergene minerals. Carminite and beudantite could be found at a surface exposure in a ravine on the opposite side of the valley. A quartz vein out-cropping in the small valley yielded some of the best pharmocosiderites outside Cornwall along with other arsenates and phosphates. Harding lode, octahedral green and purple fluorite from the Smith vein, marcasite, molybdenite, scheelite, single large quartz crystals, wolframite, and very rarely tourmaline and gold! Many of the crystallised arsenopyrite crystals occurred in calcite which has been dissolved away by collectors. From the E-W lead vein, anglesite could be found and where the vein outcropped in Poddy Gill, wulfenite and pyromorphite. Here there are two distinct collecting areas:- the high opencast workings where well crystallised pyromorphite was found in distinctive matt green curved crystals and lower down the level dumps produced adamite, anglesite, bechererite, cerussite, chenite, linarite and other secondary minerals mostly though in micro-crystals. Dry Gill is the source of the famous campylite specimens which are curved 'melon' shaped mimetite crystals. These come in a range of colours from yellow, through green to red, and often associated with a black manganese matrix producing very aesthetic specimens. Also anglesite, barite in single crystals up to 5 cms (sometimes green), cerussite, plumbogummite with mimetite crystals (not as fine as that from Roughtongill) and pyromorphite. A very old mine where supergene copper minerals could be found, and although mostly occurring as chrysocolla and malachite, good atacamite has been found. Dumps from some small old trials on the vein have produced cornwallite and philipsburgite. Mexico mine worked the veins to the east of Roughton Gill mine. Commercially it was a disaster - no significant sulfide ore body was ever found. Mimetite in many forms occurred including unusual red melon shaped crystals with green terminations and red 'campylite' type crystals in Clints Gill tip. Todd Gill tips produced mimetite specimens which although small had various unusual forms. Arseniosiderite, corkite, plumbogummite, mottramite are also reported from here. To the east of the map area Parkhouse quarry near Johnby produced aragonite reminiscent of specimens from West Cumbria with divergent cream coloured crystal sprays. The classic locality for linarite and caledonite, which at one time could readily be found on the dumps of No. 2 level. Also good anglesite in many habits; brochantite, cerussite, quietite, leadhillite, malachite, mattheddleite and pyromorphite. brochantite; cerussite; hemimorphite; pyromorphite and calcite, the later quite an uncommon mineral in the Caldbeck Fells. 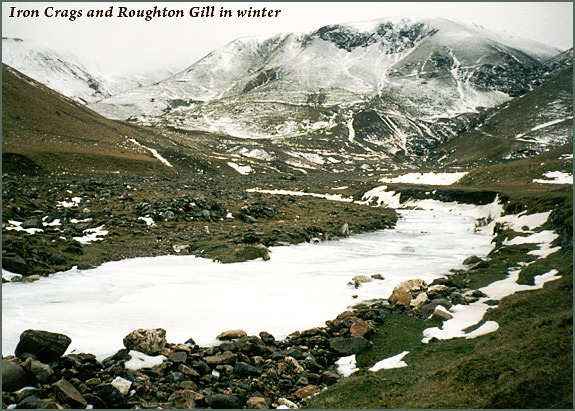 Above Roughton Gill mine where the South lode outcrops in Thief Gill and on Balliway Rigg, caledonite, chrysocolla, hemimorphite, leadhillite, linarite, malachite, mattheddleite, scotlandite, pyromorphite and plumbogummite have been found in recent times, whilst to the east the South lode was dug at outcrop and acquired the name of Barstow's Trench. Here some fine hexagonal and botryoidal green pyromorphite was found. 'Old-time' pieces still turn up at shows occasionally, the most attractive of these being pyromorphite specimens consisting of solid groups of green, curved, elongated crystals and sky-blue plumbogummite richly covered with lemon yellow mimetite crystals. 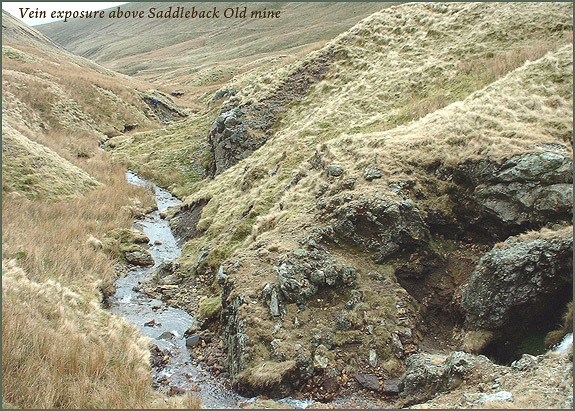 This remote mine is situated high up in the Glenderamackin valley and dates from around 1825. The exposed quartz veins in the upper valley are thought to be a continuation of the veins worked at Carrock mine. Pyromorphite in crystals up to 7mm across has been found here ranging in colour from green, through brown and white to transparent associated with cerussite, pseudomalachite, and numerous other lead and copper secondaries. A further vein exposure at the head of the valley has produced hinsdalite pseudomorphs after pyromorphite. For further details on the Glenderamackin valley mines see UK Journal of mines & Minerals, number 29. 2008. 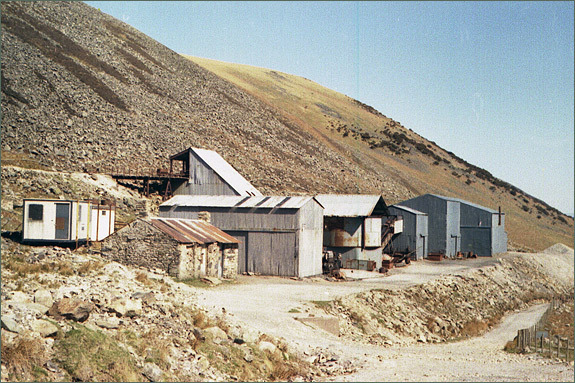 The old copper mine of this name produced numerous micro lead, zinc and copper supergene minerals including adamite and cornwallite. Not to be confused with the newer Sandbeds and Potts Gill barytes mine which were worked from 1946 until their final abandonment in 1966 and have not produce any specimens of note. 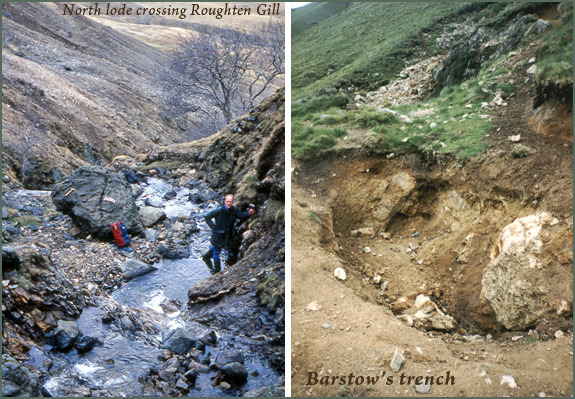 Several adits were driven in the Gill to work the continuation of the Roughton Gill North vein but it was never as prolific for specimens as Roughton Gill mine. Caledonite, brochantite, cerussite, linarite, malachite, pyromorphite, rosasite, wroewolfeite have been found but the only species of note I have seen were small but well crystallised transparent blue langite specimens. An interesting surface exposure yielding a suite of antimony minerals, including bindheimite, fuloppite, semseyite, stibnite and stibiconite.